Did you wake up with a scratchy throat? Maybe you’ve just starting coughing or feel extremely tired for no reason? Are your kids or people from work getting sick around you? 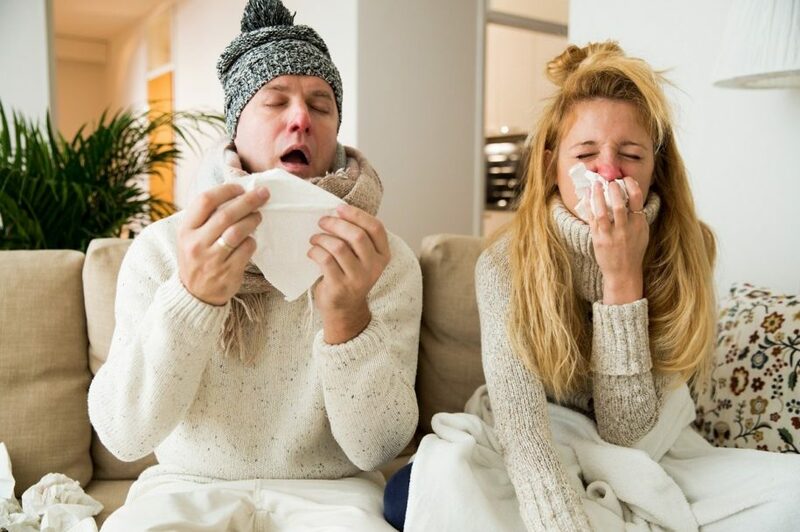 As the common cold and the flu are both respiratory illnesses, their symptoms are very similar, which can make distinguishing between them very difficult without seeing a medical professional. Cold: On average, cold symptoms are far milder than flu symptoms. You will develop symptoms gradually and will likely involve a runny or stuffy nose, but will rarely run a fever or suffer from more serious conditions. Other symptoms include a sore throat, sneezing, cold, mild tiredness, and headaches. Colds do not usually result in further complications and will resolve themselves in a few days. Flu: In general, flu symptoms are more severe and last longer than the common cold. Usually, you will have a fever, cough, sore throat, running nose, body or muscle aches, intense fatigue, headaches, and chills. Unlike a cold, the symptoms come on quickly and can last up to a week or more, though most people start feeling better after two to five days. Severe tiredness can last up to two weeks. It’s important to seek out a help from a medical professional with a flu because this illness can have serious associated complications, such as sinusitis, pneumonia, bronchitis, or ear infections. Cold: The best treatment option for a cold is getting plenty of rest, lots of fluids, and taking decongestants, pain relievers, or fever reducer medicines. Some people find relief from natural treatment options like vitamin C, zinc, and saline rinses. Hot honey or lemon tea are great for sore throats, while cough drops can help relive cough and throat irritation. Flu: Like having a cold, fluids, rest, and the previously mentioned natural remedies are the best treatment options, along with decongestants, pain relievers or fever reducers. Sometimes, you may be given prescription antiviral drugs in certain cases, but these must be taken within the first 48 hours to work. Talk with a medical professional for more information about treatment options. To avoid catching the common cold or flu this year, practice good hygiene and avoid being around others who are sick. It’s also best to prevent the flu by getting a flu shot, which not only benefits you, but will protect vulnerable populations around you, such as young children, older adults, pregnant women, and people with weakened immune systems. Other prevention options include adopting healthy lifestyle habits by getting plenty of sleep having a well-balanced diet, managing stress, and exercising. If you or a loved one is sick with the cold or flu, remember to frequently clean any surfaces you or they touch, which include door knobs, the refrigerator door, remote controls, and toilet handles. This will keep the illnesses from spreading to others or giving it back to yourself once you are better! Feel like you’re developing a cold or the flu? Make sure to call Apple Wellness Group at (865) 769-9685 to schedule an appointment today. Follow us on Facebook, Twitter, or Instagram, or subscribe to our Newsletter for more information.